In My Mailbox is a weekly meme hosted by Kristi (The Story Siren) and it allows Book Bloggers to show what they've gotten over the week. It can be books bought, borrowed, received for review, etc. There are no words for how excited I was to see this in my mailbox this week. xD I quite literally danced and went, "Squee!" 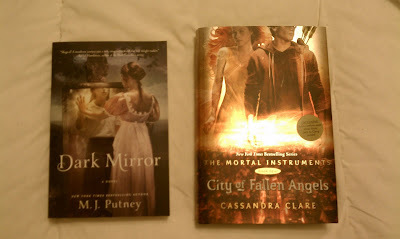 I had put in a request for it a while back and honestly hadn't been expecting to get it; so a huge thank you to Philomel/Penguin Group! 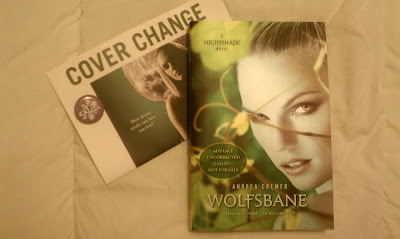 Also, the tiny purple circle you see on the cover change page is a Nightshade pin! Totally jealous you got Wolfsbane. Happy reading! I wish I had read Nightshade. Wolfsbane cover is lovely. Can't wait to read your review of Wolfsbane. i haven't read nightshade yet, but i heard many good things about this book so i am not surprised that you really loved receiving the 2nd book in the series... i think i better buy the first book so i can check it out myself! CoFA is really really awesome! happy reading! I've wanted to read Nightshade FOREVER. I hope you like Wolfsbane! I wish they hadn't changed the covers. Thanks for stopping by my blog! I'm following you now too! Wow, great IMM this week! I can't wait to see what you think of Nightshade! Eeek!! So jealous about Wolfsbane.